Please read my shop policies before purchasing. I no longer offer refunds for returns, only exchanges or store credit within 7 days of purchase. No returns accepted for custom orders or made-to-order items, and beauty products - samples are available for purchase before committing to a larger size. Thank you. * Please note - this listing is only for the leather boot belts, not the leather boots. The leather boots are used for displaying the boot belts. 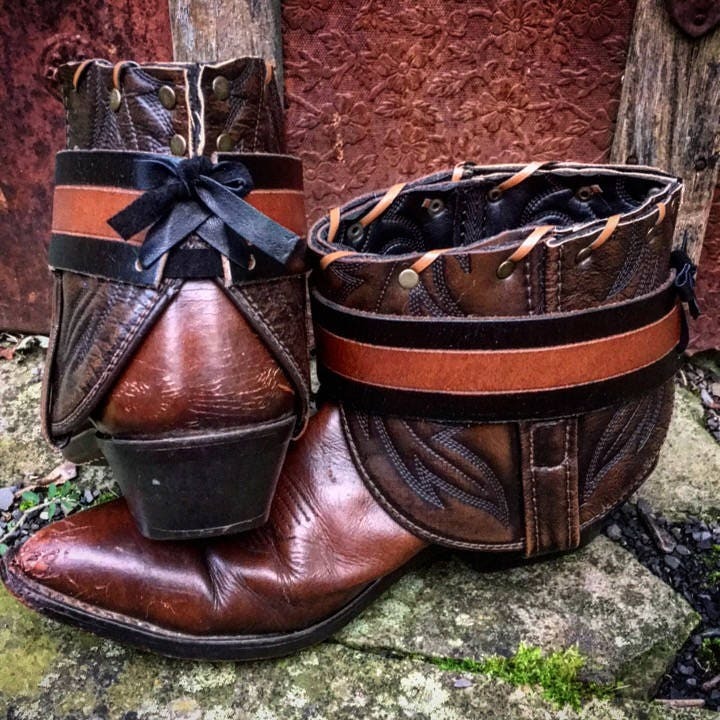 If you're interested in purchasing the boots along with the boot belts, please contact me. The boot belt accessory look is very popular this season. 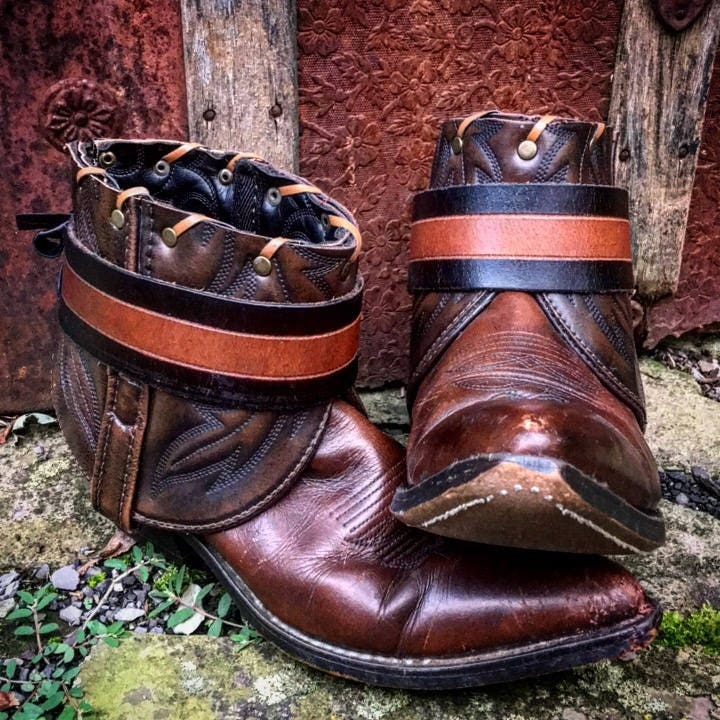 It gives your boots a new style, some bling, and oh is so bohemian! 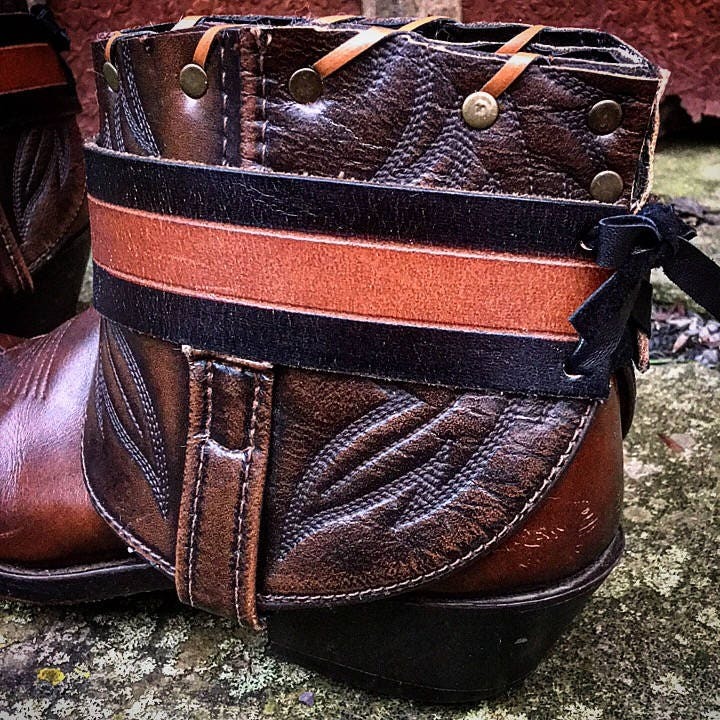 This listing is for a pair of boot belts in multi-colored black and brown genuine leather. Measures approx. 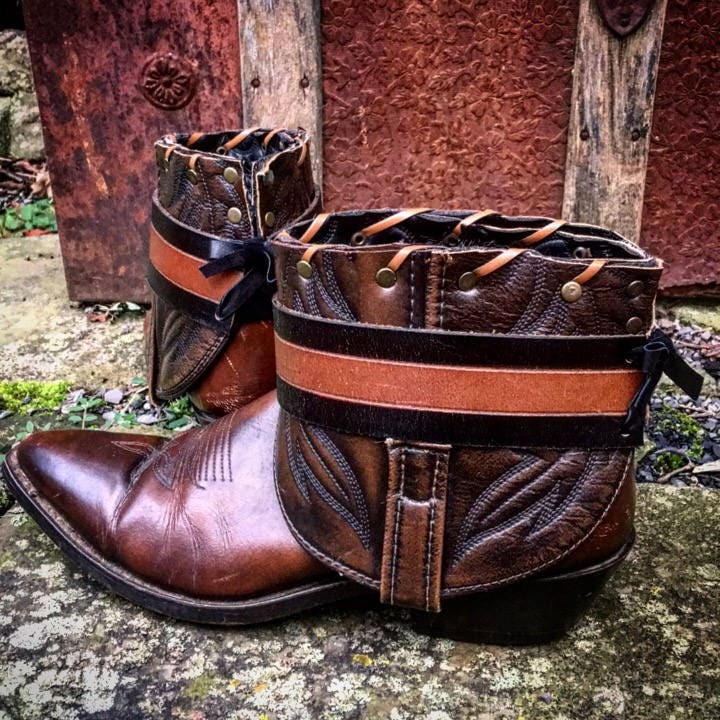 1.5" wide x 13.5" long and ties in back with hand-cut leather laces, so will fit any boot. Adjustable and removable. These look great with short and tall boots! Last one available in this style! Made from a salvaged vintage belt. 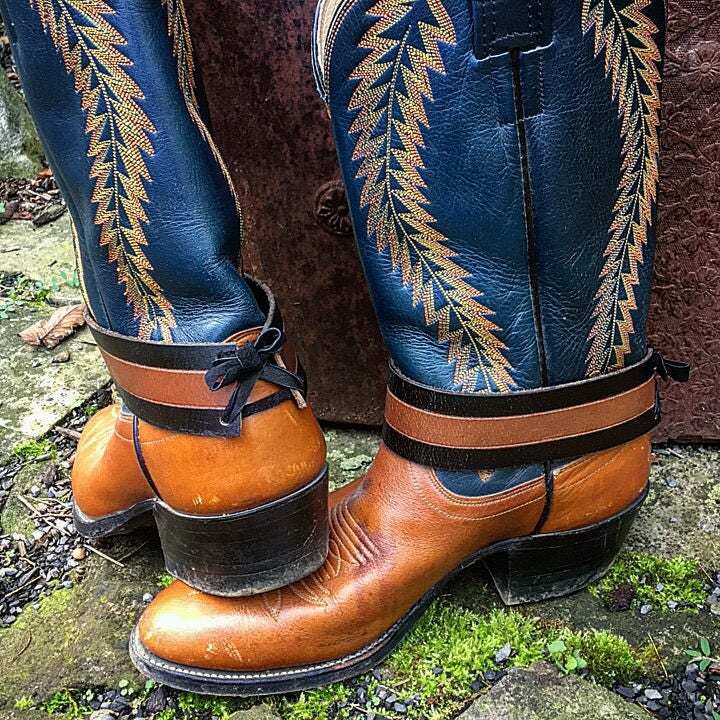 Leather boots in photos are not included in this listing, but are for sale. Check out more cute boot accessories available in my shop. Collect them all to wear with your favorite boots! These also look super cute layered with a variety of belts. Created in a smoke-free workshop. Shipping within US is Priority Mail. Please pay through PayPal, gift card, or credit card. Payment Installments are available - please contact me regarding this. I only reserve items for interested buyers upon request for a limited time, unless other arrangements have been made. Items are shipped after they are completely paid for. Thank you. All Made to Order items require a 50% deposit payment to get started on your creation. The remaining balance plus shipping is due upon completion. Items paid promptly will be shipped within 1-3 business days, unless otherwise noted. I'm happy to combine shipping charges for multiple items. If you have any questions regarding shipping charges pertaining to a specific item, please contact me and provide your country and zip code. I'll reply with an exact shipping quote for your area. ALL USPS PRIORITY MAIL SHIPMENTS ARE INSURED, BOTH DOMESTIC AND INTERNATIONAL. To save on shipping charges, I'll also ship within the US using FedEx or UPS for heavier/larger items. PLEASE NOTE: FEDEX AND UPS DO NOT DELIVER TO PO BOXES. Sorry - I no longer issue refunds for returned items, only exchanges or store credit. I also do not refund payment for initial shipping charges. Thank you for understanding. Please read each listing and my shop policies carefully before completing your purchase. If you're interested in an item, I'd be happy to answer any questions you may have, or send additional photos before you complete your purchase. If you are unhappy with your purchase, I'd be happy to provide an exchange for you (buyer pays for insured and trackable shipping both ways). Sorry - no returns, exchanges, or store credit for any perfumes, skincare products, or soap. Please read each listing carefully before making your purchase. Samples are available for purchase (depending on availability) before committing to a larger size for all of my botanical perfumes, skincare products, and handmade soap. Please contact me if you'd like a custom listing created for you for any samples, since not all samples are listed for sale in my shop. If returning an item for exchange, buyer is responsible for return shipping charges with insurance and tracking information. Return items must be sent back, or postmarked, within 7 days of date of receipt. Original shipping charges will not be refunded. Buyer is also responsible for shipping charges to send exchange. If returning an item for store credit, buyer is responsible for return shipping charges with insurance and tracking information. Once item is received unworn or undamaged, your store credit will be issued. Original and return shipping charges will not be refunded. *Reworked boots - please contact me within 3 days of receiving your boots regarding fit issues, otherwise an exchange or store credit will not be issued. You may exchange them for another pair, or return them for a store credit (buyer is responsible for return shipping and shipping charges for the exchange). Original shipping charges will not be refunded. Please measure your foot before purchasing any of my reworked boots. Please make sure to contact me regarding any questions you may have as far as fit or sizing. If possible, I'll measure the sole length and ball of foot width of the boots you're interested in for a better idea of fit. I mostly use vintage boots with character that are well broken in and the sizing could be off. I try to list the sizes as accurately as possible, but there is a risk with buying online without being able to try them on first. If slightly too big, boot socks or insoles can be added for a better fit. I do offer exchanges or store credit if they don't fit. Also, buyer is responsible for return insured shipping. Once I receive the item back from you in original, unworn and undamaged condition, your exchange or store credit will be issued. Return items must be sent back, or postmarked, within 7 days of date of receipt. If an item arrives damaged, please contact me within 3 days of receiving your item. In this case, an insurance claim will be filed. Please open and inspect your item(s) immediately. I track and insure all of my shipments. In this case, refunds could take up to 30 days or more. If your item is damaged within 2 weeks of use, please contact me within 2 weeks of receiving your item. I will try to work with you. I will either try to fix the item for free, or offer store credit (buyer pays for insured shipping expenses both ways). Thank you for understanding. If your item is lost in the post for more than 30 days or arrives damaged, please contact me and I'll file an insurance claim through Etsy. Once the claim is approved, I'll issue you a refund for the price of the item only. I do not issue refunds for any postage paid. I'm sorry for this but I cannot be held responsible for what happens to items once they are shipped. Insurance Claim Policy - If your item(s) arrives damaged, please hold onto the damaged merchandise in the event you are requested during claims processing. Failure to retain damaged property could affect final settlement of the claim. To receive an item refund, you will also be requested to sign a buyer’s affidavit confirming the damage or lost package. I need to submit this, along with a form and a receipt of the merchandise. In the case of lost mail, we are required to wait 30 days before filing a claim. Gorgeous. Look even better than I expected.